Play #1: We build an online system or network where people can interact and collaborate professionally on business projects part time online (i.e. outside of the bounds of traditional employment as noted in Income Reengineering Principle). 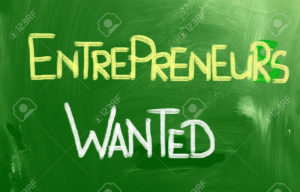 Every one can participate part time as an entrepreneur, independent contractor or independent consultant. People work within their field of expertise, career field or field of professional interest, no marketing or selling required. Just show up for work online. By participating, people earn immediate income while building ownership equity and residual income through co-ownership relationships. who want to help advance the Income Reengineering Initiative. IRBDN functions as an online corporation or virtual corporation staffed with supporting entrepreneurs, professionals and average workers who work part time over the internet. 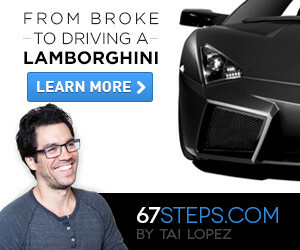 All online staffers earn productivity and ownership based income. There are no wage or salary based positions. People own this percentage without having to invest a dime. All people have to do is submit a resume, position themselves professionally within the enterprise and show up for work online part time. What if you and 10 other part time or moonlighting entrepreneurs met after work in an online garage to map out a team business plan. Each of you agreed to work part time and perform a specific function to support the plan and each of you agreed to share and benefit from co-ownership of the resulting enterprise. To carryout the IRBDN Operational Mission, the Income Reengineering Business Development Network (IRBDN) works like a massive business incubator designed to nurture, crowdfund and spin off thousands upon thousands of these co-owned business enterprises that are 100% owned by all participating entrepreneurs who work part time online for the enterprises. This is how we bring Play #1 to life where people can work online part time for one of these co-owned enterprises and build ownership equity and residual income wealth. working within their career field or area of professional interest. NO traditional employees or hourly wage/ salary based compensation. The beauty here is that people have real time control over their pay. They are not limited to a pre-determined hourly wage or salary. So, if people want to get a raise, all they have to do is increase their productivity and they will receive that raise immediately through productivity based compensation. Once cashed out, people can reinvest and buy ownership shares in their new co-owned enterprise similar to selling one house and buying another one. 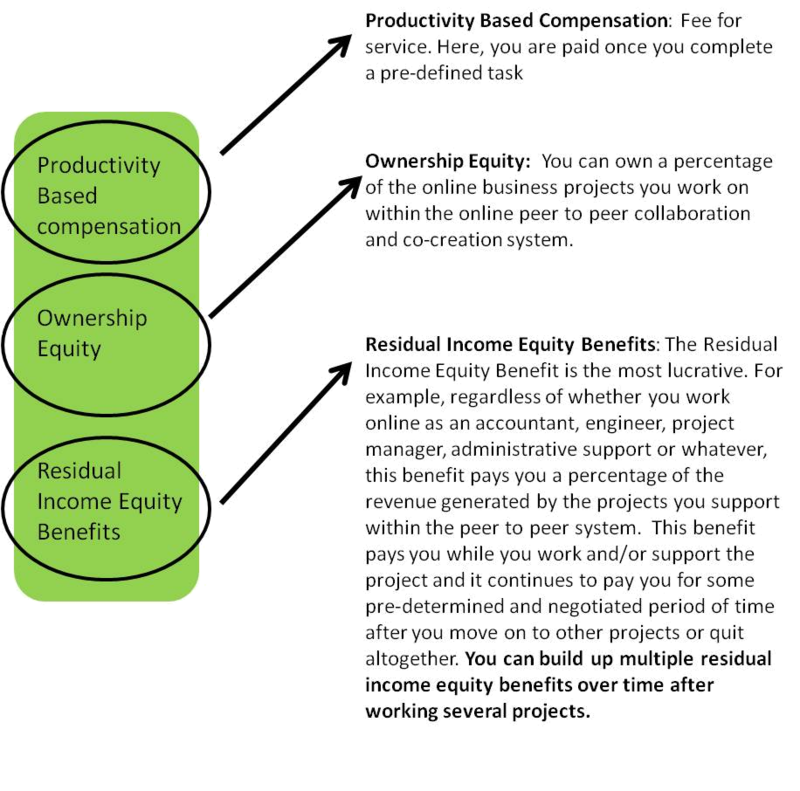 In fact, the income producing and wealth build power of Productivity Based Compensation, Ownership Equity and Residual Income Equity Benefits make Play #3 possible. 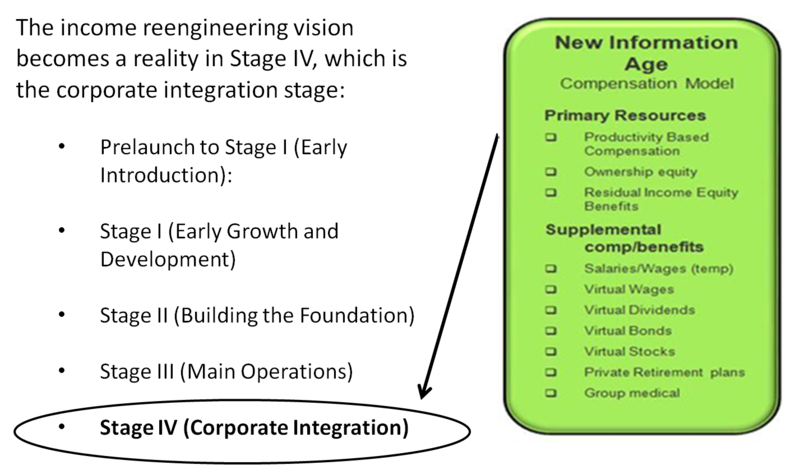 Once built, anyone with an internet connection will be able to work online part time within their career field and build wealth through the ownership equity and residual income equity benefit compensation models. Again, the focus is on a large number of people supporting one single objective. In this case, the large number of people are people who want to support the Income Reengineering Mission and Vision, most being members the Income Reengineering Business Development Network (IRBDN) looking to benefit financially sometime in the future. Therefore, as we grow and expand IRBDN stage by stage, we raise millions to support and crowdfund the formation of brand new co-owned enterprises that will hire people to work online part time within their career field and earn income and build wealth via the productivity based compensation, ownership equity and residual income equity benefits as outlined by the Income Reengineering mission. With that position they will be able to secure crowdfunding dollars to paydown bills, build up savings and build a comfortable financial foundation prior to working full time for a co-owned enterprise. 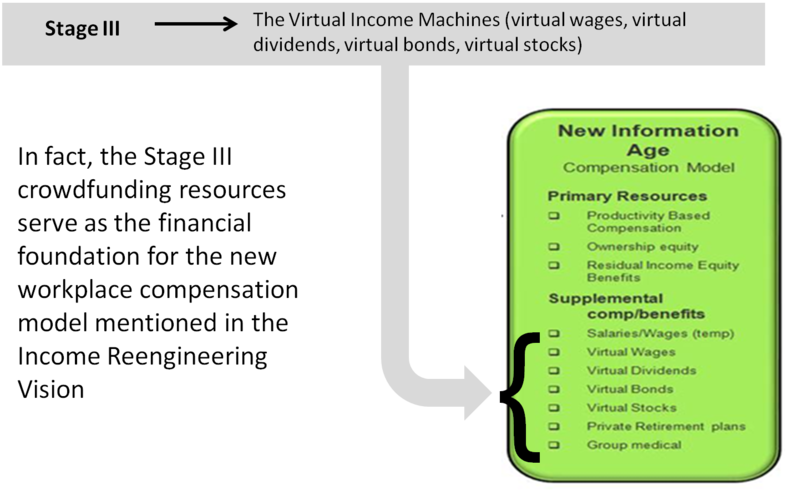 Then the Income Reengineering Vision becomes a reality in Stage IV as shown. In fact, in Stage IV, IRBDN operations will strategically involve companies and corporations as they seek to use the IRBDN system to maximize corporate profits and financially empower their workforce. This brings us back to the notion of economic research. Economic research comes into play as IRBDN management and members work together to continuously field test, tweak, update, modify and add to operations as required to continuously increase the economic value and entrepreneurial opportunities necessary to advance operations stage by stage. To continue on, review IRBDN Entrepreneurial Incubators.